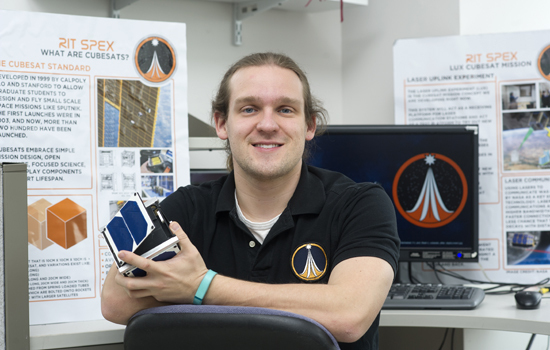 Anthony Hennig, who says his dream is to become an astronaut and support space exploration, marks a first for RIT. He’s been chosen as the student delegate for graduation ceremonies of both his bachelor’s and master’s degrees programs. After graduation, he’s off to pursue a Ph.D. in systems engineering. The sky’s the limit for most Rochester Institute of Technology graduates, but not for Anthony Hennig. He’s aiming even higher. Hennig, of Richmond, Va., has studied five years at RIT and is graduating with dual degrees: a bachelor’s in mechanical engineering with an aerospace option, and a master’s degree in science, technology and public policy. He is also the first to serve as delegate to two of RIT’s colleges on graduation day: he is the undergraduate delegate for the Kate Gleason College of Engineering and the graduate delegate for the College of Liberal Arts. He’s been accepted in George Washington University’s Ph.D. program in systems engineering. Hennig is one of approximately 220 students this year graduating with dual degrees or majors. It’s a trend that RIT administrators—and prospective employers—greatly welcome. They’re known as “T-shaped” students because the additional majors or degrees go beyond the basic skills and education required for their degree, giving their studies more depth. 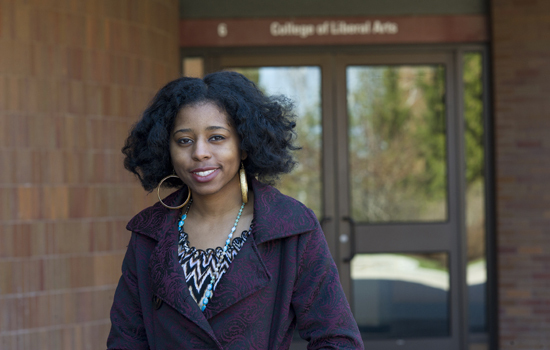 Ja'Nai Gray of Rochester, N.Y., is majoring in criminal justice and sociology, with immersions in health and culture and women and gender studies. A doctorate in law is in her target, focused on law-making or lobbying. Gray did research in both fields of her majors and was able to land an internship at the Monroe County Public Defender’s Office. She also met with Rochester Police Chief Michael Ciminelli and began a program to help at-risk youth in Rochester. Brianna Larson of Stockton, Mo., majored in international studies and added a political science major in the College of Liberal Arts after taking an American government course. She hopes to work for the government in intelligence or immigration or refugee services. 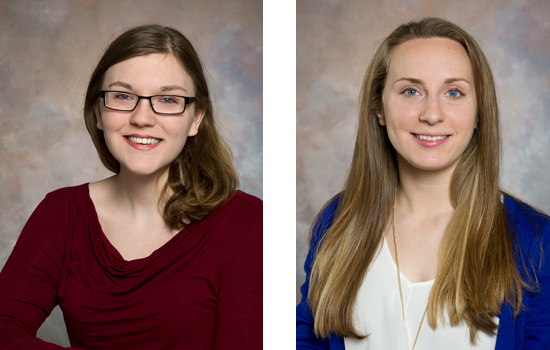 Victoria Scholl, an imaging science major from RIT’s College of Science and a motion picture science major from the College of Imaging Arts and Sciences, will be spending a year after graduation in Switzerland as a Fulbright Student. Scholl grew up in Hudson Valley, N.Y., and decided to attend RIT when she learned about its motion picture science program. She said having two majors was extremely helpful in landing three summer internships. Scholl said having two majors gave her access to different people, knowledge and opportunities. Yasmeen Smalley-Norman, who graduated in 2013 with a BFA in photojournalism from CIAS and a BS in biomedical photographic communications, with minors in environmental science and journalism. Smalley-Norman is the vice president and 3D modeler at The Hydrous, a nonprofit organization dedicated to modeling coral reefs. Originally from Houston and now a resident of Dover, N.H., Smalley-Norman will produce 3D models and photographs to map coral species in the Philippines. Her work will be used to scientifically identify species and update the CoenoMap, a web-accessible map-oriented database of corals in the Philippines. RIT was named a top producer of Fulbright students among master’s institutions for 2015-2016. The university has had six awardees in the past three years. The Fulbright competition is administered at RIT through the RIT Global Office. Similarly, 40 international students from 25 countries attended RIT this year through the Fulbright Foreign Student Program.